The Plymouth Rock or “Barred Rock” is a breed of domestic chicken from the United States. It originated in New England in the middle of the 19th century ( first exhibited as a breed in 1869) from cross-breeding of Dominiques and Black Javas Cochin and Brahma. Color of the feathering: The birds of this breed have striped feathering with different shades. There are also, birds with white, black, and pale yellow plumage color. In males at the neck and waist black and white stripes are narrower than in hens and figure seems a little brighter. In hens color striped feathers are more vivid on the neck and lower back feathers are not different from the basic color. 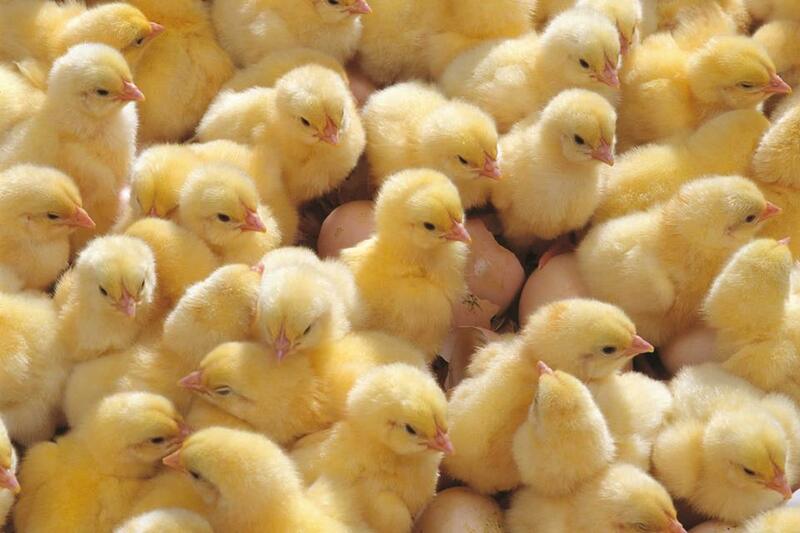 Day-old chicks are covered with black feathers, and have bright spots on stomach area. Earrings are oval, the ear lobes bright red. Neck: Medium length and densely feathered. Wings: tight to the body & slightly raised. Back is broad and horizontal; it has a small lift to the tail. Tail: small, with thick plumage, laid back, with moderately long braids. Thighs: short with thick plumage and yellow metatarsus. Hens begin production at the age of six months. The origins of the Leghorn are not clear; it appears to derive from light breeds originating in rural Tuscany. The name comes from Leghorn, the traditional anglicisation of Livorno, the Tuscan port from which the first birds were exported to North America. The date of the first exports is variously reported about 1830 and 1852. They were initially known as “Italians”; they were first referred to as “Leghorns” in 1865, in Worcester, Massachusetts. Leghorn chickens are small with a vertical wedge-shaped body, which is typical for them to sign. Skin color is mostly yellow or flesh-colored. Head – a small, leaf-shaped with a comb and a long, thin neck. The color of the legs is yellow. Tail: wide, with a slope of 40 ° with respect to the body. Leghorn starts laying usually at 4.5 – 5 months of age. The instinct of brooding is missing, so to replace them young hens must be purchased. A year later, the bird is usually exhausted, which is not surprising with such a unique performance. Therefore to keep Leghorn layers in production for more than a year is not suggested. Puberty in the birds of this breed comes relatively early, in 17-18 weeks. Hatchability is low and it reaches a maximum of 92%. Fertilized eggs are typically 95%.